Take a good look, this is one of the most mysterious, massive objects ever discovered in the cosmos. We don’t really know what it is, but this thing is huge, spanning 55,000 light years across (the approximate radius of our Milky Way). What makes this all the more intriguing is the fact that this object formed only 800 million years after the Big Bang and it is 10 times more massive than the next biggest object observed in the early Universe. But what is it? As light can only travel at the speed of light, astronomy isn’t only a means to observe distant intergalactic objects, it is also a means to look back in time. This blob exists in the murky, outermost reaches of the observable Universe, 12.9 billion light years away or 12.9 billion years ago. 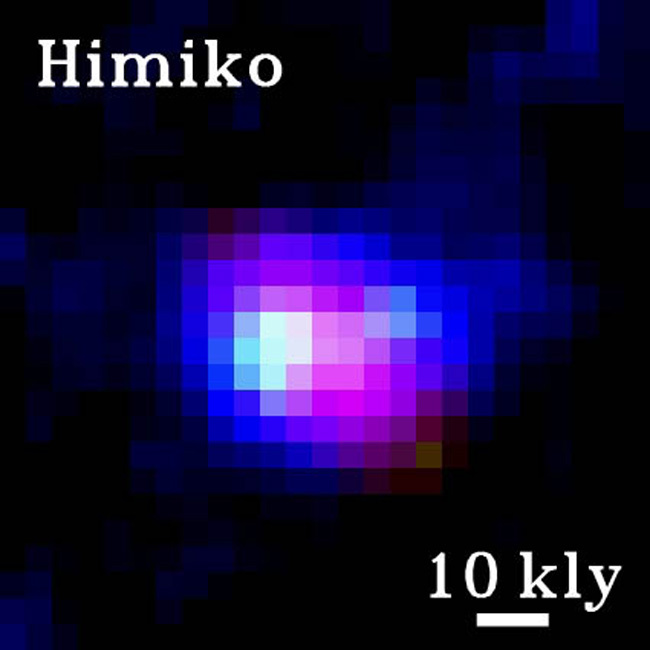 Using the Subaru telescope in Hawaii, the fuzzy object named Himiko (after an ancient Japanese queen), was discovered in 2007, but was nearly missed. Fortunately it was detected and a team of researchers headed by Masami Ouchi were able to carry out follow-up observations with the Keck/DEIMOS and Magellan/IMACS arrays. By studying the spectroscopic signature of the “blob”, Ouchi was able to determine the signature of ionized hydrogen gas and the distance (and therefore the age) of the mysterious Himiko. Now plans are afoot to point other observatories at Himiko. This mystery object could be a vast cooling cloud of plasma just before galactic formation, or it could be the ionized halo surrounding a supermassive black hole. The Chandra space telescope could be used to analyse the object for X-ray emissions, possibly revealing the presence of a black hole, or the Hubble Space Telescope could determine whether Himiko has proto-galactic characteristics. Amazingly, Himiko straddles an era of Universal evolution known as the “reionization epoch“, which occurred between 200 million and 1 billion years after the Big Bang. Before this time, the Universe was awash with energy, but star formation was not possible as clouds of gas could not cool to coalesce and create stellar nurseries. Therefore, anything further away (and therefore further back in time) would be very hard to observe as not a lot of ‘objects’ were generating radiation for us to detect (if there were any ‘objects’ at all). So when astronomers spotted this behemoth floating so distant, it ignited speculation about how Himiko exists at all. It gives more informative message for me. It is very amazing. Thanks for sharing it. really very true. Thanks for sharing. Man, people hadn't studied Earth and close space well enough yet, so what's up with this 12.9 billion old thingy? We should better think about not destroying ourselves for now.